It's the last weekend before the Christmas holiday, which means it is crunch time for shoppers who still have people left on their list. If you have an Apple fan or two among your friends or family, here are the best remaining deals on Apple gear that you can still get now in time for Christmas. iPad mini 2 - starting at $249 . Target, Best Buy and Walmart are taking $50 off the 16GB WiFi model of the iPad mini 2, bringing the price down to $249 for the 2013 tablet. Best Buy and Target sweeten the deal by extending the $50 discount to all iPad mini 2 WiFi models. iPad mini 2 WiFi + Cellular - Starting at $379 - Best Buy is taking $100 off the WiFi + Cellular models, while Target is offering the cellular-enabled tablet with a $50 discount. iPad Air - starting at $249 - Best Buy us taking $50 off the iPad Air WiFi models and $100 off WiFi + Cellular versions. Target also is discounting the iPad Air, taking $50 off the price of the tablet and offering an additional $25 gift card with the purchase of select versions. MacBook Air - $855 - Best Buy is taking up to $200 off select MacBook Air models. The best deal is on the 11.6-inch MacBook Air with 4GB of RAM and 256GB of flash storage, which is available for $899. MacBook Pro with Retina Display - $855 - Best Buy is taking up to $200 off select Retina MacBook Pro models. The best deal is on the 13.3-inch MacBook Air with 8GB of RAM and 512GB of flash storage, which is available for $1,599. MacBook Pro - $855 - Best Buy is taking $100 off the non-retina 13.3-inch MacBook Pro with Intel Core i5, 4GB Memory and 500GB Hard Drive Apple iPod Touch 32GB MP3 Player (5th Generation) - $20 gift card with purchase - Target is offering a $20 gift card with the purchase of a 5th generation iPod Touch 32GB. Apple TV - $89 - Best Buy is taking $10 off the Apple TV iTunes Gift Card (email delivery) - $85 for a $100 gift card - PayPal through its Digital Gifts on eBay channel is offering a $100 iTunes gift card for $85, a 15 percent discount. The gift card is delivered via email as a code. Deal ends in just a few hours at 10:59AM EST on December 19. iTunes Gift Card - $85 for a $100 gift card - Both Sam's Club and Costco are selling a $100 iTunes gift card multipack for $85. That is $10 off the $95 member price. Requires a membership to each retailer. iTunes Gift Card - $5 off any gift card purchase of $50 or more - Target is offering a $5 discount on a $50 purchase of select iTunes prepaid digital download code (email delivery) items. 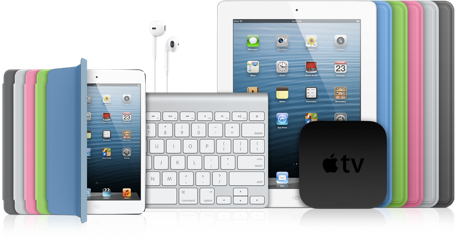 Best last minute holiday deals on Apple gear originally appeared on TUAW: Apple news, reviews and how-tos since 2004 on Fri, 19 Dec 2014 08:00:00 EST. Please see our terms for use of feeds.